2017 was a busy but happy year for Hugo. Here's a bit about what happened! The year didn't start out terribly well as Hugo had quite a bit of illness early in the year. As soon as school started he had a few long stints in hospital with very bad respiratory issues - a couple of these very serious stints in intensive care. We originally put this down to aspiration or illness but it kept happening with no apparent other reason and so we then started to think about what else might be triggering these periods of respiratory distress. After much thought one possibility we came up with was that he was very allergic to mould. He had been attending physio at a local clinic situated in an old house. It was known that this house had mould in it in places and the physio did suggest this as a possibility for what might be causing his respiratory issues. This seemed like a plausible possibility and so we stopped taking him there (he now does physio at home) and once we did this he didn't have any other (serious!) illnesses during the year. Since those early stints in hospital last year he's been really quite well overall and (touch wood!) hasn't been in hospital at all! Hugo otherwise has had a very happy and productive year. He's starting to make some real progress with communication and in the past few months he has learned to 'high five' with people as a way of saying hello, which is fun. You have to be very patient waiting for the little hand to come up and meet yours, but he does eventually do it. He's very pleased with himself when he gets praise for that and continues to always be very impressed with himself for doing clever things. School has continued to be really enjoyable for Hugo. He is very popular with his classmates and his best friend Maddison has been with him from kindy now, and is in his class again for 2018, which is lovely. They have a very special bond and Maddison rarely leaves his side at school. For the 2017 Christmas concert Hugo dressed up as a koala for the class performance, which was super cute - you can see a picture of that in the gallery above. 2017 was our first year of NDIS funding. While we did end up getting a pretty good package of funding for Hugo's therapies, equipment and care support the interactions throughout the year with the NDIA were unbelievably frustrating and upsetting. I won't go too much in to all of that here, but it really was a difficult part of the year. However, in the end we have managed to get funding for some new car seats (one for our car and one for Bertie and Bunny) plus some other equipment that he desperately needed. But a great part of the year was that with the funding for a care/support worker for Hugo we were able to find Thomas who became a great support to the family and a great friend for Hugo. Thomas is a medial student who came to work with Hugo during the summer holidays while he was on a break from Uni. He did some great things with Hugo and even bought him a little basketball set - as you can see in the photos. Thomas has now returned to uni but we are lucky that his sister, Rosie, has joined us to help look after him after school on 2 or sometimes 3 days a week, which is a great support for Bunny and Bertie. So there have been some big bonuses about having the NDIS funding introduced, despite the frustrations that it has also caused. Hugo turned 7 in 2017 which we can't quite believe! He's now incredibly tall and is such a friendly and sociable boy. He continues to really enjoy the company of others and loves to be the centre of attention at parties and gatherings. Like his brothers he's a high achiever in his own way and is always incredibly proud of himself when he masters something new or when he does something clever. There's lots of examples of this in the gallery photos from the past year. Overall it's been a pretty positive year for Hugo with not too much ill health, lots of happiness and enjoyment and some progress with his communication and physical achievements. He's recently started school for 2018 and has a wonderful teacher who is creating some fantastic experiences for him. He often comes home with a button recorded by his teacher with an update of the day and he loves to press the button and "tell" us all about what he's been up to. This is a great initiative given that he obviously can't tell us about his day himself. We are looking forward to a fantastic year ahead and can't wait to report on his new achievements next time! As usual I haven't had a chance to update Hugo's blog as much as I would like but I thought I would put together a bit of an end of year update about what has been happening throughout 2016. Hugo has enjoyed his first year at kindy. Earlier in the year we had to take some family photos so he could take these to school and some of these turned out really nicely so I thought it would put a few of these below. Hugo has made quite a bit of progress with a range of things this year. His communication has been improving quite a bit which has been helped enormously by his interactions at school. We are now seeing quite a bit of consistency in subtle communication signs, particularly between people he knows well. He is now very good at showing when he's upset or uncomfortable and his smiles are very clearly in response to things that make him happy (e.g. the sounds of familiar voices or sensory activities that give him enjoyment - e.g. in the leaves below on his Autumn holiday). We are trying more adaptive switch toys and buttons with him to help him learn and develop more communication skills. His school, St Lucy's, have been trying lots of different techniques to help with communication. One such tool has been a button that helps Hugo "say" good morning to his class and teachers. When they go around the morning circle Hugo is encouraged to press his button that has been programmed with "good morning Mrs Gold" and is quite good at now using this. We see this as very early stages of him potentially learning some speech or at least some kind of verbal communication down the track maybe. Here's a video from a few months ago with Hugo saying "get well Tall Grandpa" who had a bad fall and broke his pelvis....gives you an idea of how this early communication is starting to take shape with him. He is also making strides with his physical development. His walking with the walking frame is getting increasingly better all the time and he gets lots of enjoyment from the praise he is given when he does this well! As you can see in the video below...! He is also getting quite good at walking just on his own with people holding both his hands. Hopefully during 2017 that will continue to improve and perhaps we can drop to him walking with just a single hand. School has been lots of fun and he's enjoyed lots of parts of that. HIs teacher, Viv, and teacher's aide, Suzie, have both been absolutely fantastic with him and have tried to develop a whole range of ways to adapt the curriculum to his abilities. Earlier in the year he and I really enjoyed an excursion his class took to the Museum of Contemporary Art. We took a bus trip to get there (you can see below how excited I was to have to do that without a car seat for Hugo - that was certainly a challenge for the hour bus trip there and back but we both survived pretty well actually!). We enjoyed a great day together looking at the various exhibitions. There was a lovely sensory room with costumes and soft things to lie in and Hugo and his classmates really had a great time. So that's some of the good news of the year! So that's a quick snapshot of the year. I'll finish off on a more cheerful note with us all setting up the Xmas tree and decorations last weekend. Hugo came over to stay so Bertie and Bunny could have a well deserved a night out so we took the opportunity to set up the tree together. Hugo of course loved to play with the tinsel and enjoyed looking VERY closely at all the lights on the tree and he really enjoyed the Xmas carols playing in the background. Merry Christmas to you and your family from ours....more to come in 2017! Isn't it just wonderful to see so many smiles these days?! He's waving his arms in songs he recognises, often looks up for his name, looks for his light and take itwhen found, loves the light box, does lots of mouth movements at feeding times, shows 'affection' when close... looks up at you when you talk/sing! Is reaching out and discovering his peers sitting alongside him in morning circle! Verbalisations... and more! Fantastic, I think he is enjoying school! A few weeks ago Viv also sent us this lovely collage of her and Hugo laughing at school. Viv sends collages of the kids every day - showing what they did and things they've enjoyed. It's such a great thing to receive, especially for kids that find it hard to communicate what happened in their day. If only all kids could have such a wonderful school experience! A quick post to put up a few pictures of Hugos' first day as a kindergarten boy! Quite an amazing accomplishment and a day I really would have struggled to pictures 5 1/2 years ago. But it couldn't have been better. His new school - St Lucy's at Wahroonga - is absolutely terrific and he has the most incredible teacher and teacher's aides who are already doting on him (and his other class mates). In fact I reflected on the pictures I have been sent from the school this evening and thought that if only more children had the opporutnity to have an education like what it seems will be given at St Lucy's then the world would be a better place! Today I saw a collage of images of the teacher lying on the floor reading books with the children. How nurturing, fun and educational - all at the same time! There's one thing about having been too busy to update Hugo's website for the past 6 months and that is that when I have come back to update the blog and looked at my last entry I can't quite believe the progress Hugo has made in such a relatively short period of time. Here's a snapshot of what's been happening! Bertie and Bunny took their big annual holiday late in 2015 and Hugo came to stay with us for a few weeks. The other boys, Caleb and Archie, loved having him to stay and we just hung around home, went to the park and generally relaxed and had fun. Here's some photos from during that time. Morning ritual - iPad and chatting with Hugo in bed. Hugo not so thrilled to be having dinner together! Hugo's time as a preschool boy has now come to and end. The experience Hugo and the family have had at Waterford Preschool has been nothing short of incredible. Hugo has loved the interaction with the other boys and girls and the staff at the preschool we so kind, patient and loving to him and the extended family. Hugsie loved the music lessons, reading, painting, going on the trampoline and he had lots of room to be able to walk up and down in his walker. His communication skills have made some dramatic changes with him now turning to respond to sounds and to show he can tell if someone new is coming to say hello to him - generally smiling as they approach. If you would like to read the report of Hugo's time at Waterford you can do that here. It has examples of the things he did there and the progress he made. A terrific keepsake from his period as a little preschooler. Hugo and his nanny, Jodie, practising walking at Waterford Preschool. Hugo, Bunny and Bertie have had a big move this year. Moving from Bellevue Hill up to Wahroonga to be close to St Lucy's, where he will start school this year (more on that below). This has been a big adjustment of everyone and has also meant that his regular days with nanny Jodie have sadly come to an end. Jodie has been an incredible support and carer for Hugo and they have developed a very special bond. 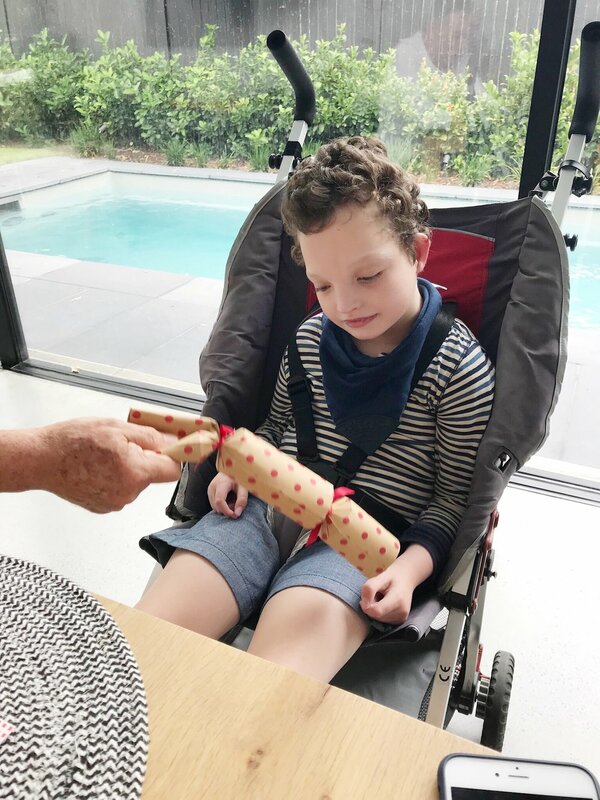 She will still be making trips up to Wahroonga to babysit once a month or so but the family definitely miss her positive energy and enthusiastic support for Hugo's accomplishments - not to mention the hard work she puts in to his physio. Here's a photo Jodie took one day on one of their regular walks and trips to the park. As you can see he's very happy in her company and loves the swings! Hugo's physical progress has been remarkable over the past 6 months. He's now walking well on his walking frame and spending longer periods standing and supporting his body weight. He now uses a rope to hang on and practise standing which makes him have to correct his balance and use his upper body strength. Here are some photos from a physio session about 3 months ago (November 2015) and his progress has improved even more since then. He's not always thrilled about going to physio as Debbie and her team (at Therapies for Kids) work him very hard. But by pushing him beyond what everyone (except Debbie!) thinks he can do, he's making some very promising progress towards independent standing, and perhaps independent walking down the track as well. Tomorrow is Hugo's first day as a big kindergarten boy, so I will save the details of what school is like for future posts. 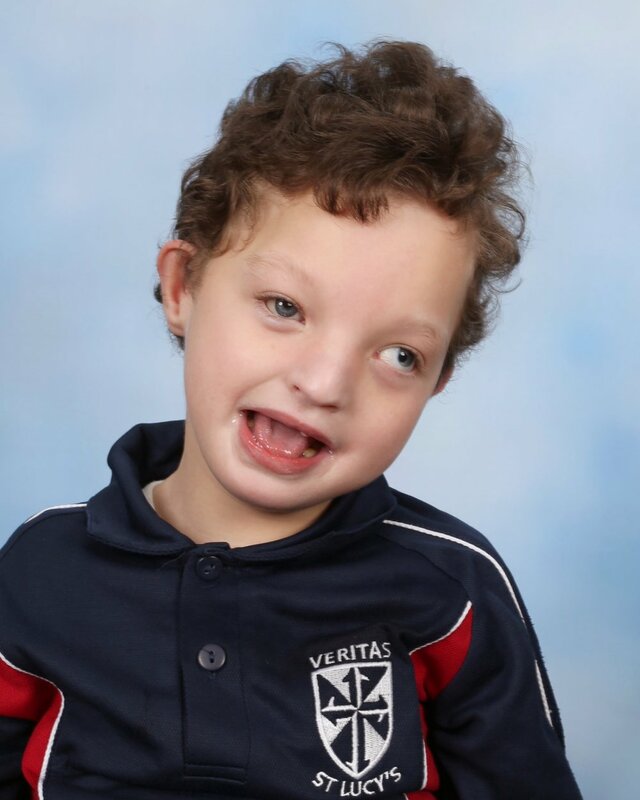 St Lucy's is a special school in Wahroonga and we feel very lucky that Hugo has been accepted to go there as they have such a wealth of experience with kids like Hugsie and so far have been really kind and welcoming to us all. Here's a picture of Hugo at his orientation day at St Lucy's, with Bunny and Bertie. Everyone is very excited (and also understandably apprehensive as all parents of kids heading off to school!) about this next chapter in Hugo's adventures. I personally can't quite believe that Hugo is already a school boy - this year I have a Year 2 boy and a kindergarten boy - how time flies! It makes me very proud to see Hugo standing so grown up and tall as a 5 year old school boy on. It's quite simply amazing.